The statue coughed twice, sending a cloud of dust into the air. Tendrils of ectoplasm snaked out of the statue's nose, and billowed into the display case. The cold fingers of phantasmic goo sought the key hole near the top of the glass, and oozed through the lock mechanism. The figure coalesced on the other side into that of a slender man with delicate hands. He peered at the statue through the glass and shook his head. The artist was more of a mere craftsman, and simply hadn't managed to capture the boyish line of his jaw, or the laughing smile in his eyes. They'd dressed his statue in gaudy fabrics befitting a prince, conveniently ignoring his more simple attire in life. Prince Aken-Aten stretched, imagining his joints popping as they did before he died, and looked around the room. He'd grown tired of exploring the Egyptian Gallery, filled as it was with familiar things. He wanted to see the world, and learn more of what happened after his death. He walked away from the case and stuck his head into the corridor. Tableaux of stuffed animals lined the route, re-enacting scenes from the North African desert. Aken-Aten bowed before the noble lion, and marvelled at the cobra, rearing as it ready to strike. He followed the passage and the decor changed, turning from desert vista to lush jungle. Aken-Aten recognised the greenery but the animals were alien, covered in stripes, or shaped like hairy men. The Prince spent the evening touring the Natural History gallery, teaching himself to read the strange symbols on the wall beside each display. He even visited the gift shop, marvelling at the small reproductions of the stuffed animals. He believed them to be toys, albeit ones very different from the wooden or bone games they had at his father's court. His sister would have loved the soft fur of the lion cub. The sky beyond the windows grew pink, and Aken-Aten made his way through the museum to return to the Egyptian gallery. He allowed himself to dissipate, feeling his limbs grow long and his body expand, and his ectoplasm fingered a path through the key hole into the case. It forced itself up the nose of the statue, and turned its thoughts to sleep as the dawn broke. 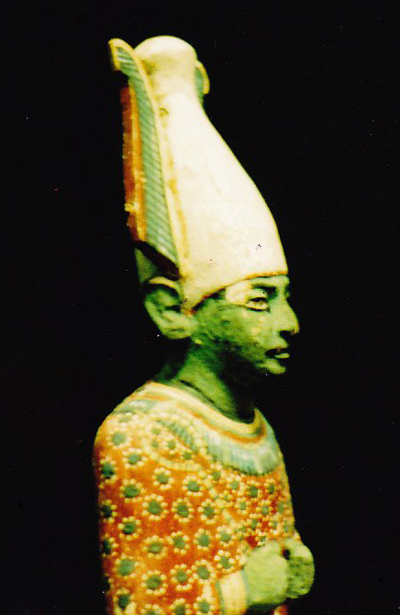 Roland peered into the display case containing the funeral effects of Prince Aken-Aten. He stared at the statue in disbelief for a full five minutes, before turning to shout for his assistant. "Mavis? Mavis? The statue's moved again!" This flash was inspired by this news story! I wondered from the beginning if it was inspired by that news story! We're on a wavelength here. And even though the statue isn't quite a mummy, it's enough like a curse-mummy to make me exceedingly happy you wrote it into being. I loved this! I loved the imagery of the "phantasmic goo" slid out of its statue. The story was engaging from sentence one! Great job, Icy! Fabulous use of language in this piece Icy.. I could feel the ectoplasm engulf me as I read ..and a couple of times I was sure that your uploaded image was smiling at me..
Great inspired story. That news report captivated, didn't it? I enjoyed the opening image, with the goo squeezing through the hole. Room for some follow up adventures perhaps? Yes! An almost-mummy story from the grande dame! This was great, I loved how he worked on learning to read and actually liked the kitsch in the gift shop. Is he going to slip through the front door and see the world next? This was great. I liked the idea of a curious, intelligent phantasm. He should take up with an historian, maybe use a Ouija board to tell his life story. Oh my gosh! I loved the story but the news story it was based on just blew me away! That is so cool, and you have such a cool take on it! So fun! Such a great touch seeing the humanity of the character, and the natural curiosity we have to want to find out about the world around us. Cool as always. You certainly have a quirky talent! Loved this. I liked how the ghostly prince's rendering used a method popular at the same time as the original King Tut fad, and that he took the modern sights in his stride. Nice spin from the news story! Mystery solved! Ripped from the headlines. Hey, wasn't that picture facing the other direction when I started reading? Now that is one mummy/ghost I want to meet! After reading everyone's comments I had to look up the news for I hadn't heard of it. You should submit this as "The Explanation" Icy. :) Super imagery! The news story fascinated me, too. You took and and brought it to life, if you'll pardon the obvious cliché. Enjoyed this so much, Icy. Terrific sensory elements, such as imagining his joints popping. Thanks, Icy. I've often wondered what those statues get up to when the lights go out! I enjoyed the story.